Now when you log into Cafe World, you can expect a free bonus each day! 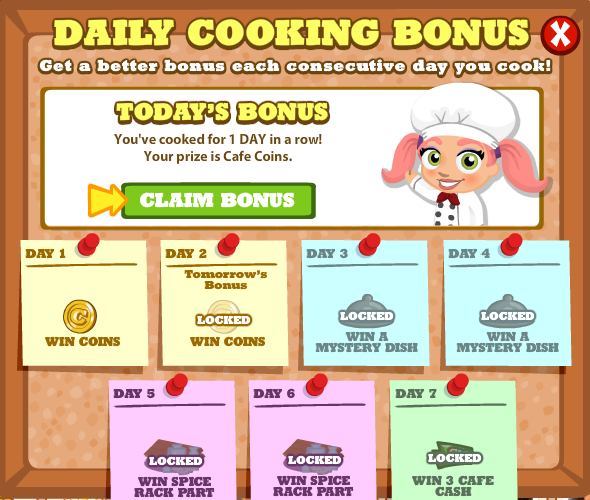 This new feature is very similar to Restaurant City's Free Daily Ingredient(s), which awards players with one free ingredient for checking in the first day, and then up to 3 ingredients per day, once they've logged in at least 3 days in a row. The difference, however, is that Cafe World lets you know what you'll be earning for each day of logging into the game. Day 1, which is today, earned me 705 Coins. Tomorrow, another batch of free coins is expected. Days 3 and 4 are Mystery Dishes. Days 5 and 6 are Spice Rack parts. And Day 7 seems guaranteed to net me 3 Cafe Cash! And here's the best part -- after you click on "Claim Bonus", you'll get the chance to post the good news onto your Facebook Wall to share your bonus with your friends!